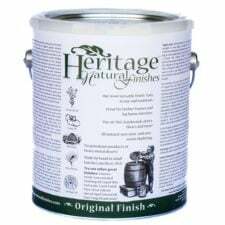 Exterior Finish – Heritage Natural Finish is recommended mainly for exterior use. 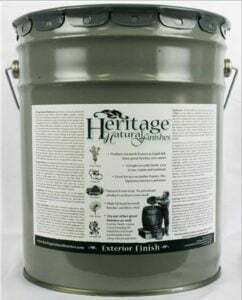 It is the Original Finish with both a UV inhibitor and mildewcide added for extra protection for exterior applications. 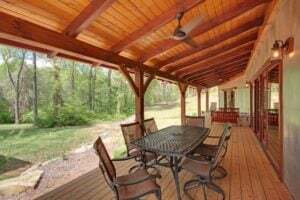 Exterior Finish is great for large timbers, or even logs, siding, decks or any outdoor furniture, trim or wood elements. You can apply it by can be spraying, brushing or ragging. When applied properly, Exterior Finish will bead water, but it still allows the wood to breathe. 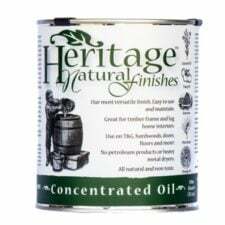 You don’t need to strip off the old finish to re-apply Heritage Natural Finishes – and they can be reapplied every year each year if needed. Coverage: Approx. 350 square feet per gallon or 500 board feet per gallon; rough-sawn materials tend to absorb more, and wood density affects coverage. Softer woods like pine or reclaimed Doug-fir will absorb more than denser woods such as hickory. The second coat will give you more coverage than the first coat. And obviously dry wood will soak up a lot more oil than green timbers. You should order more than you think you need, rather than less. *For additional protection against insects, consider treating all wood with a borate solution before oiling.